SwarmRelief forms part of a series of works exploring Behavioural Production; which seeks to compress design and production within one creative process. The relief is designed partially through generative multi-agent computational processes executed on a computer, and partially through algorithms executed in real-time directly within the fabrication process. This real-time code determines the precise behaviour of a CNC machine’s trajectory and velocity in which it carves out a series of curves. 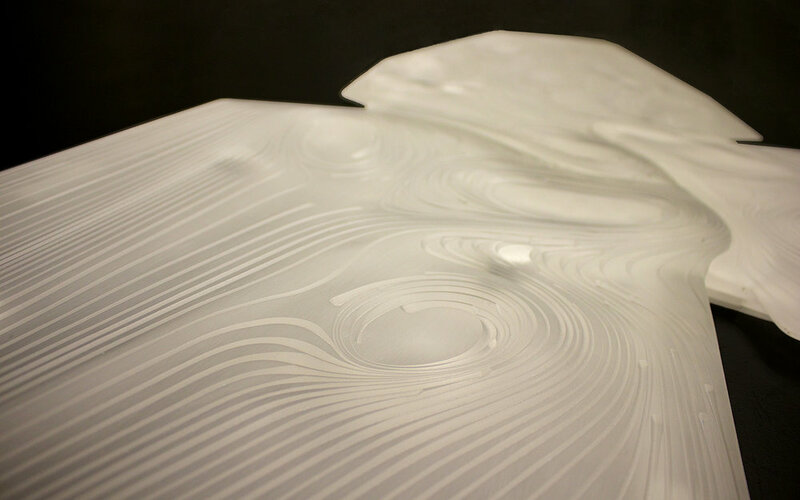 These curves are qualitatively enhanced through the algorithms engagement with the machining process that differentiates its behaviour throughout time and space. The overall affect of the piece arises from this process and describes a detail of fabrication not easily replicated without engagement with the real-time operation of the machine. Fusing design and production within one creative process opens up design freedoms not possible through computational design processes alone, and enables design to embrace production contingencies such as reducing machine-time as a productive constraint that drives competitive innovation within design.